flowers and deep ravines are typical signs of a “flysch zone”. In the west, the rain water turned the Schrattenkalk formation in the Gottesacker area into one of the Alps’ most extraordinary karst landscapes. The almost complete lack of vegetation, the deep fissures and the rock crevices as well as the razor-sharp rock formations are all reminiscent of a fossilised glacier. From a distance, it can be compared with a sad, grey and endless cemetery. the wild Stillach River to the Heini-Klopfer ski flying hill. though! From the ski flying hill, continue up the road towards Schwand and Ringang, an impressive plateau to the south of the Freibergsee Lake. 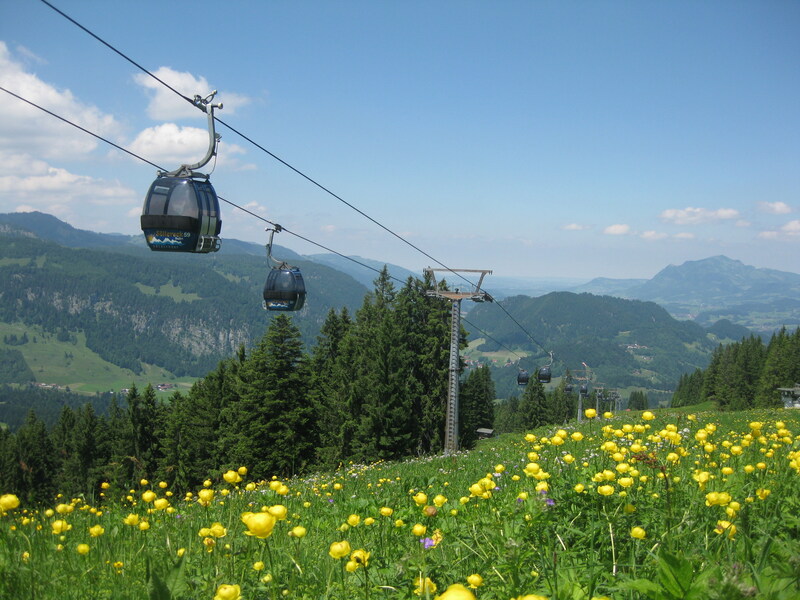 From here, the sunny trail with its panoramic views heads back downhill, passing the Fellhornbahn valley station and Anatswald to Birgsau. For many people, this is the rewarding and picturesque end point for the hike. If you’ve not yet had enough though, we recommend the climb through the mountain forests to Einödsbach. After visiting Germany’s southernmost inhabited village, simply retrace your footsteps to Birgsau from where regular buses will take you back to Oberstdorf. By hiking from the Söllereckbahn summit station to the Alpe Schlappold hut on the Fellhorn, you follow in the footsteps of the famous mountaineer Anderl Heckmair and discover numerous information boards with fascinating facts about various stages of his life. For example, about the early days of his explorations in the Eastern and Western Alps and the Dolomites, which he embarked upon back in the late 1920s. First, you will reach the rustic Sölleralpe hut, above which the ridge trail towards the Fellhorn begins. Away from the well-developed paths that link the cable cars, this takes you through sections of Alpine terrain. Several slightly exposed passages have steel cables for your protection. After passing the Schlappoldeck and the Schlappoldsee Lake, you will reach the Fellhornbahn middle station, from where a cable car will comfortably transport you down into the Stillachtal Valley in the far south of Germany. 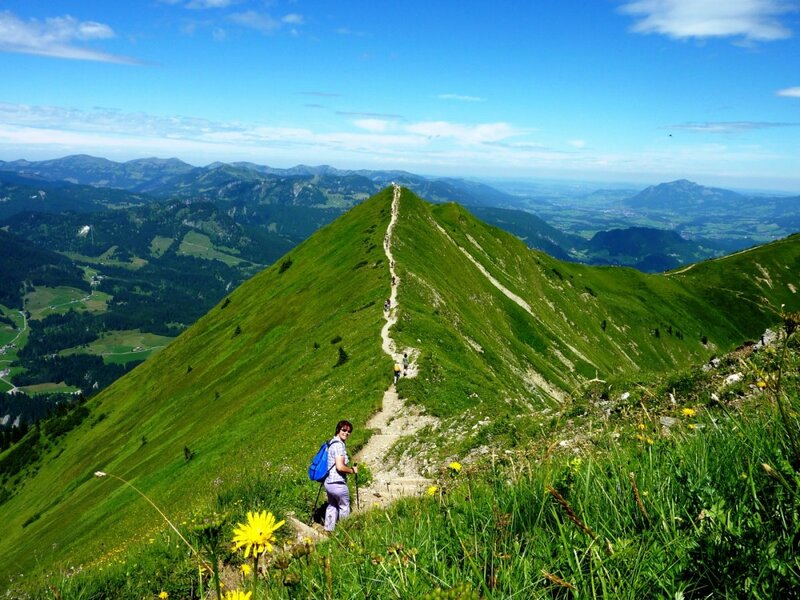 Probably one of the most popular hiking routes in the Allgäu. After ascending on the Söllereckbahn cable car, we take the time to enjoy the spectacular view of the Upper Allgäu region from the Schönblick. If you like to challenge your fitness, you can also ignore the cable car and ascend to this point on foot. 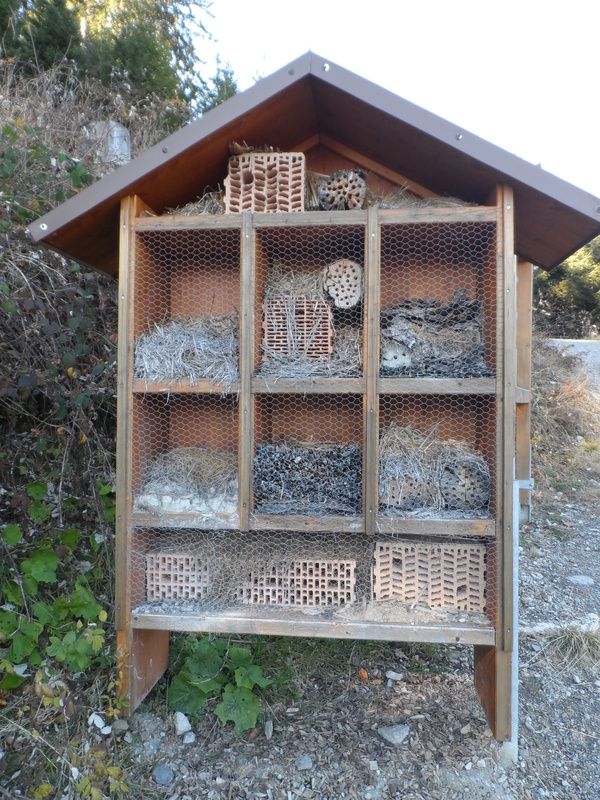 The nature trail with its many interesting stations then takes us across the Hühnermoos, a high moor with unique flora and fauna, and through a shady mountain forest to the Hochleite. 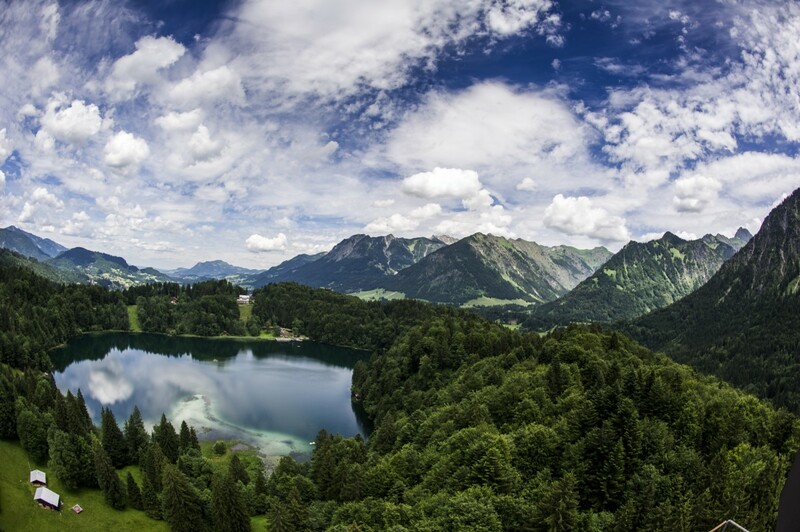 On route, we are regularly greeted by spectacular views of the Oberstdorf Basin and the upper Stillachtal Valley. The Hochleite is a plateau that sits high above the Stillachtal Valley and slopes upwards to the north. In the midst of the pastures in which cows are reared in the summer, our hike becomes flatter and sunnier. 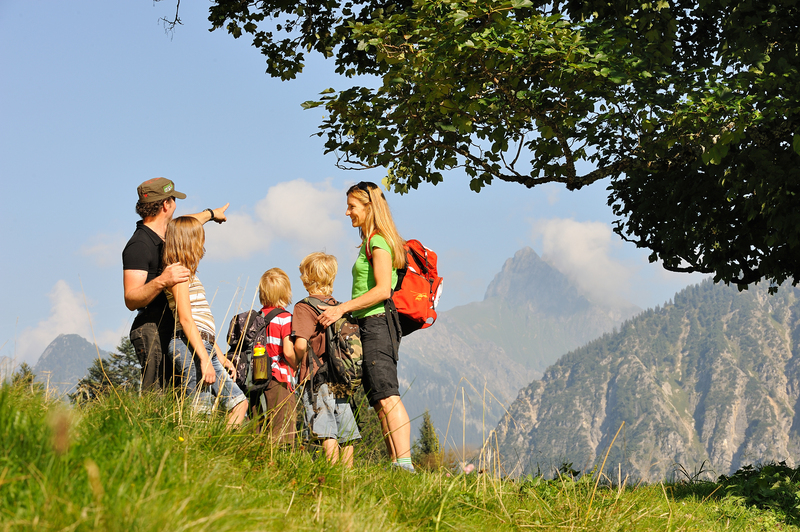 In addition to the all-round mountain panorama, little ones in particular will be especially impressed with the view down into the Stillachtal Valley and over the main massif of the Allgäu Alps! At the end of the plateau, a varied descent takes us through idyllic mixed forests and across clearings with spectacular views to Schwand. After passing this little hamlet, there is still plenty more of interest to come. 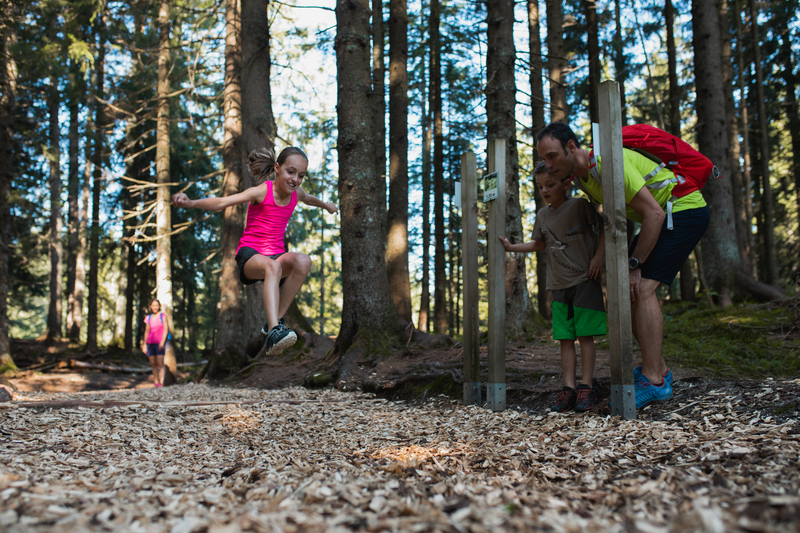 A visit to the nearby, newly renovated Heini-Klopfer ski flying hill is a lofty and impressive experience. The Dr.-Reh-Weg path then continues further north along the right-hand side of the Freibergkessel Basin. 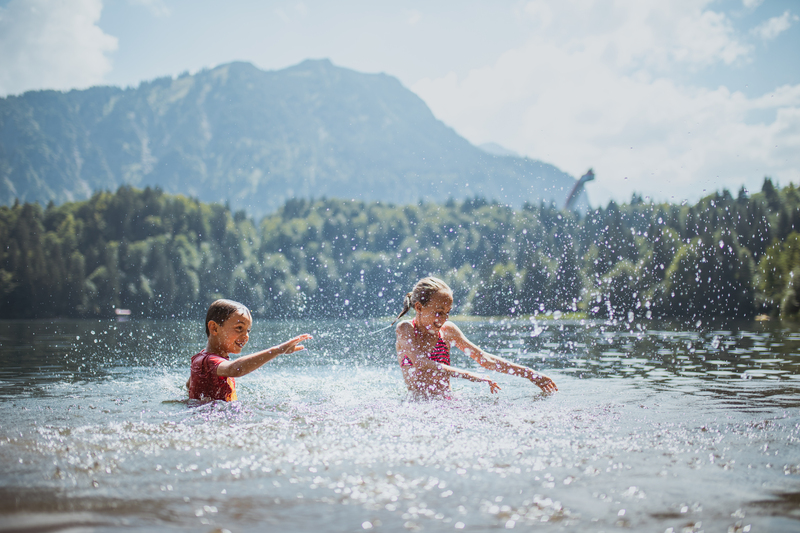 If you want to admire the picturesquely ocated Freibergsee Lake in its full splendour, a short detour to the viewing point to the north of the lake at the Seeblick café and hotel is extremely worthwhile. The final section of the hike leads down a slightly steeper, woody descent to the lower Renkstegbrücke bridge and from there across the sunny meadows back to Oberstdorf.